Atleast Three Frames: 1) Introduction: The Blank-Book-To-Be. 2) In A Windowless Corner. 3) Fear and Sleep - Marginal Utility, Inc. Marginal Utility is proud to present Atleast Three Frames: 1) Introduction: The Blank-Book-To-Be. 2) In A Windowless Corner. 3) Fear and Sleep, a performance by Philadelphia-based artist Jim Grilli. The performance component of Atleast Three Frames is a monologue delivered by the artist in approximately three parts. Throughout its duration the singular voice of the artist will be interrupted as audience members are invited to interact with the objects in the gallery during specified periods of time, read a scripted dialogue with the artist, and participate in a group discussion. 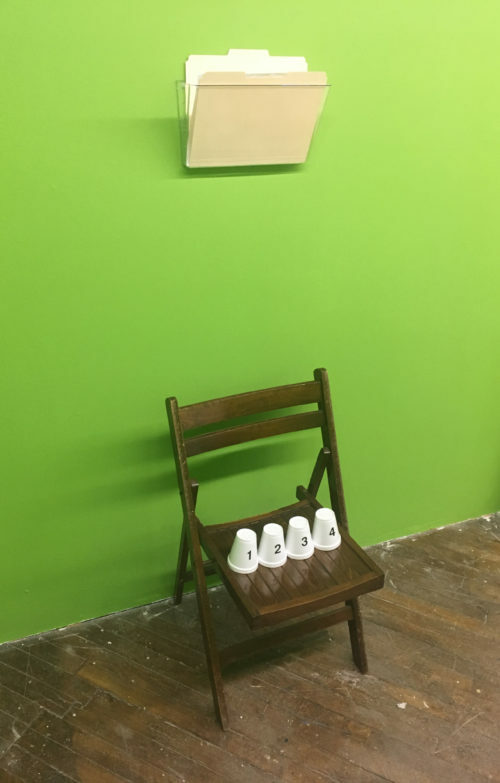 Upon coming into the gallery for the performance please take a folding chair and sit wherever you would like in the space. Please be sure to not block any of the black shapes painted on the walls and to position your chair so you are facing the table-like forms. Once everyone has taken their seats the event will begin.